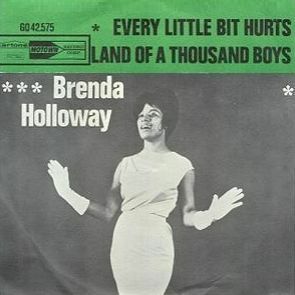 Brenda Holloway isn’t the biggest name in soul music, but she was on top of the world when this song hit 1965. She opened for the Beatles on their U.S. tour that year, and performed at the legendary Shea Stadium show. The story behind “When I’m Gone” is more interesting than the song itself. Originally slated to be Mary Well’s follow-up to “My Guy,” the song was given to Holloway when Wells spurned Motown for 20th Century Fox Records. Despite being an alto to Well’s soprano, Berry Gordy thought Holloway was best-suited to put lead vocals to Well’s backing track. 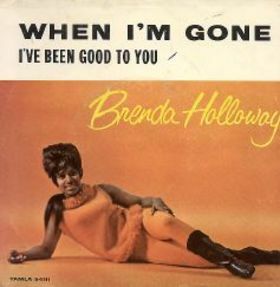 “When I’m Gone” wasn’t as big a hit as “Every Little Bit Hurts,” but Holloway kept making singles for the next three years. Shortly after recording the original version of “You’ve Made Me So Very Happy” (later a huge hit for Blood Sweat and Tears), Holloway retired from the music business. Deeply religious, Holloway was disillusioned with Motown and conflicted about the lifestyle expected of a young star. Although she was just 22, Holloway had been making records for 6 years. After a 12-year absence, she returned with gospel album in 1980 and a pop album in 1999.